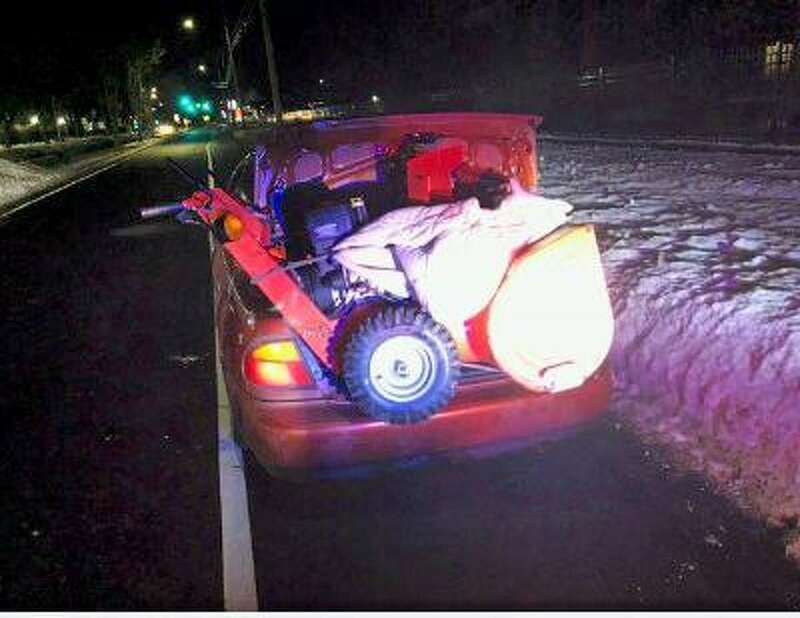 FAIRFIELD — A large snowblower jutting out of a car trunk — and blocking the license plate — led to the arrest of the two men inside that car early Wednesday morning. It turned out the large snowblower had been stolen from a pickup truck parked on Black Rock Turnpike. After the officer pulled the sedan over on Kings Highway just before 4 a.m. he found the car was unregistered, the plate belonged on another vehicle, and there was no insurance. Luis Quinones, 30, said the car was his but he was letting Fernando Ruiz, 34, drive it because he did not have a license. Quinones told police the snowblower belonged to Ruiz’ uncle, but Ruiz denied knowing who the snowblower belonged to and said it was the property of Quinones’ uncle. They agreed to show where they got the snowblower and led officers to the intersection of Bibbins Avenue and Jennings Road. After being read their rights, they agreed to lead officers to the exact house, but another officer had already located the snowblower’s owner. That officer saw a pickup truck parked in a Black Rock Turnpike driveway, its tailgate down. The resident confirmed his snowblower, valued at $2,800, was missing. Ruiz allegedly told police he had agreed to drive Quinones because Quinones had been smoking crack and said he considered changing his mind when he realized Quinones was stealing the snowblower. Quinones, police said, admitted to stealing another snowblower from the same area on Jan. 3. Quinones, of William Street, Bridgeport, was charged with third-degree larceny, conspiracy to commit third-degree larceny, possession of drug paraphernalia, an obscured registration plate, unregistered vehicle, misuse of plates and no insurance. Ruiz, who lives on Deacon Street in Bridgeport, was charged with third-degree larceny, and conspiracy to commit third-degree larceny. They were each held on $1,500 bonds and are scheduled to appear in state Superior Court in Bridgeport Jan. 25.